Tuesday Tips & Tricks: "The All-Important First Mark"
Posting and sharing your latest sketches is fun and exciting. You feel good when other people "like" and make positive comments about your efforts. But what if someone, whose name you do not recognize through your regular groups, shares or reposts your work? You can only hope that their intentions are good but you really have very little control over it...or do you? Do yourself a favor. Somewhere on your sketch write this simple text line: "© [current date or year] by [your name]." 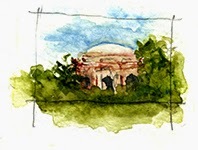 According to the Copyright Basics circular from the U. S. Copyright Office <<http://www.copyright.gov/circs/circ01.pdf>>, adding this copyright signature is really not necessary because you are granted copyright protection from the moment you create your original sketch, painting, sculpture, etc. Social media, however, has a way of separating and detaching artwork from its original creator. People tend to post verbatim what they find that is interesting and pay little attention to whom should get credit (if any). Also, the person posting or reposting an image is not necessarily the original artist on the piece and that can be misleading. In my examples, I make it a habit to always write “© 2014 Wesley E. Douglas” along the edge of my sketches. The reason I am suggesting this is because it is not the responsibility of anyone who views, shares, repins, retweets, or reposts your image to make sure you are properly credited. That responsibility falls on your shoulders. And by writing this simple line directly on your artwork it will be less likely to get separated from the sketch than adding it to the comments box. this is not the time to be shy. 2. When a media outlet wants to use your image for an article they are working on, having some kind of identification on your artwork will make it easier for them to contact you for permission to use your image. 3. When you are staring at a blank page in your sketchbook, adding this simple signature makes the perfect first mark on your page. Lincoln Square in Chicago is a winner location, and we are never tired of it. On July 19 we gathered in Lincoln Square for the third time, and it was the biggest group ever! Here are some photos to document the sketch crawl. Our sketches from Lincoln Square! And afterwords we went to Brauhaus. We had beer, pretzels (amazing! ), and brats and talked about sketching, pens, sketchbooks, and future plans. What a great day it was! How many times did you have to attend a boring event? Yep, me too. Often it is a fancy party or a benefit for some very noble cause you get to attend with your spouse. It is their cause, and you are just along for solidarity and support. Yawn! A little book and a pen will fit in your evening clutch or sport coat pocket. Get them out when they will begin speeches. Keep your eyes on the speaker. It is too dark to see anything on your paper anyway. Have the pen touch the paper and go. Trace the shape of his head with your eyes and let your fingers follow with the pen. Then his neck and shoulders. What is he wearing? Trace those lapels. Is there any hair? Add it, if applicable. If you want, you can glance down at your paper every so often - this is not a test. When you have the basic outline down add some darks. Just scribble in any way you like to create dark masses. Add facial features without being too specific. Put in some details, if you have time: a tie, a necklace if any. You are done. Turn the page and find another victim attendee. You may find that your heads are sometimes detached from shoulders. Facial features may land outside the heads, a tie may be pinned to a shoulder like a tail on a donkey. This all is fine and even great, you don't have to show your drawings to anyone. You will also find these sketches oddly expressive and free. And you will realize that you are no longer bored. In fact you may not even notice that they finished with speeches, and it is time for the rubber chicken. Good. You can sketch that woman sitting across from you. What you are doing is practicing blind contour drawing. Blind contour drawing is a method of drawing where an artist draws the contour of a subject without looking at the paper. This artistic technique was introduced by Kimon Nicolaïdes in The Natural Way to Draw, and then made popular in Betty Edwards' The New Drawing on the Right Side of the Brain. Nicolaïdes instructed his students to imagine that the pencil point is actually touching the contour of the subject. He suggested that the technique improves students' drawings because it causes students to use both senses of sight and touch. Blind contour drawing trains the eye and hand to work as a team, and it helps to really see all of the details of the object. The drawings above I sketched blindly in the dark at a benefit for Chicago Institute of Psychoanalysis I attended with my husband. The speeches were coma inducing and the chicken awful… I had fun! A Japanese poetry form, haiku focuses on moments in the environment and connects them to the human condition. They are concise, using only the number of syllables that can be said in one breath. They are expressive, capturing those fleeting moments for us to appreciate. Sounds like Urban Sketching to me! 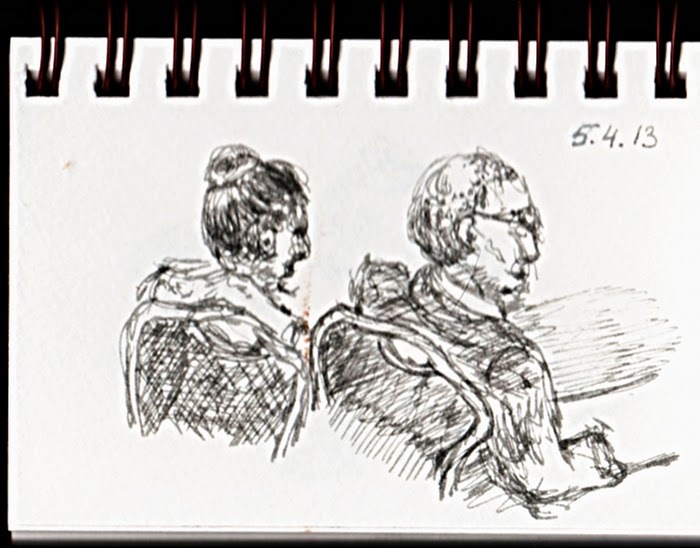 Many of us Urban Sketchers carry a small sketchbook with us wherever we go. We capture fleeting moments of our days while waiting in line, catching a quick cup of coffee, on the train or bus. Whenever and wherever we can we draw our connection with the world around us.There is a need to be fast and concise! 1. Think Small - about the size of a credit card or smaller. 2. Keep It Simple - avoid details and the need for perfection. Think simple shapes and values. 3. Focus - what catches your attention? Pin point your subject. Hint: If you spend more than five minutes on these small sketches you may be putting in too much detail. WHAT ARE THE BENEFITS OF SPEED SKETCHING? About 2.5” wide sketches done in the car on a road trip to Ohio. Continuous line, 4 values, simple shapes, watercolor and pencil. Time: I don’t remember but they helped make the long ride go quickly! 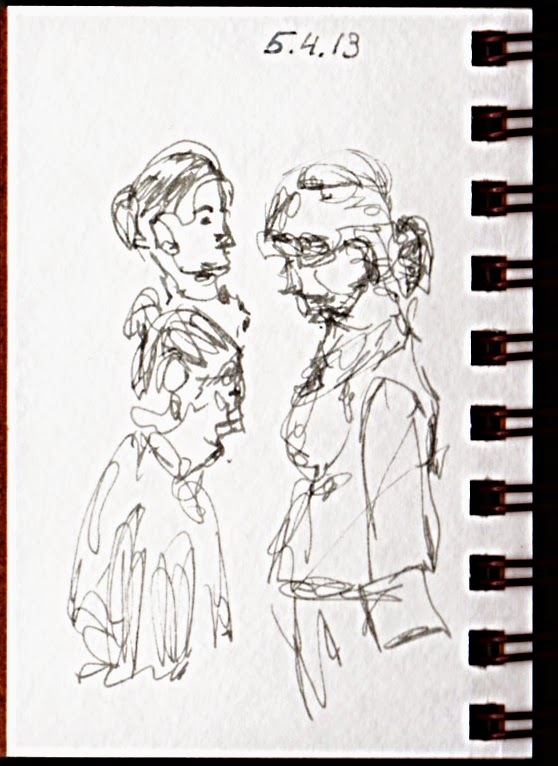 Poetry of speed sketching –capturing fleeting moments in time and recording a reaction to them. I call them Tone Poems. 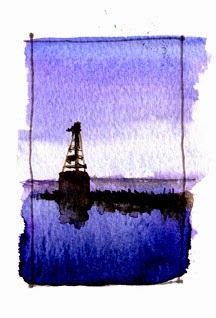 Today we announce a new feature to the USk Chicago blog--a weekly urban sketching "Tips & Tricks" post. Each Tuesday a new sketching tip will be shared. Tips will span a range of topics and will aim to give you a new skill to work on during that week. 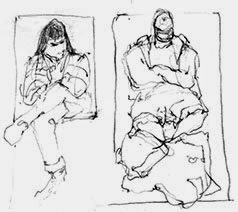 Before you know it you will have a new arsenal of sketching ideas, tips and tricks to use on sketching outings and to refer back to, all in one place, on our blog. Blog posts will also be posted to our Pinterest board "Tips and Tricks," so if you want, you can share these and other pins with your own followers. If there is something you would like to see as a post, please add your suggestion in the comments below. The question often comes up about how to draw people. Drawing people can require years of anatomy study and practice to get the proper proportions. 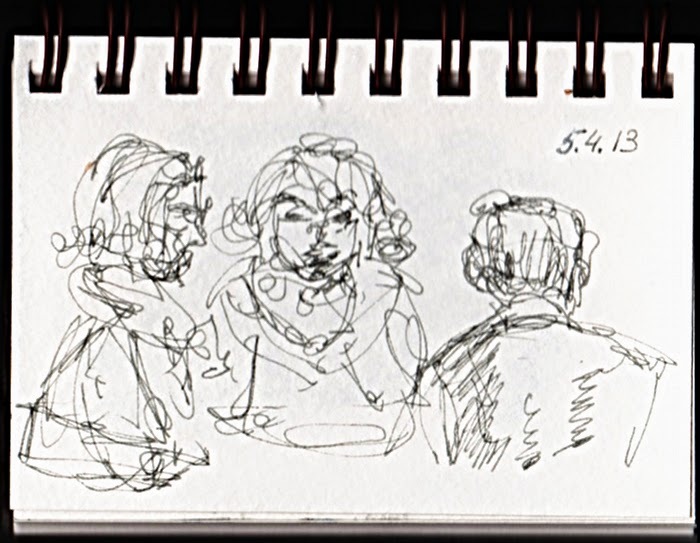 For those of you who do not have that kind of time, here are a few of my favorite tricks for adding people and a human element to your urban sketches. First let us review why you would want to add people in the first place. If you still have questions, pose your question in the comments section below. Thank you. 5. 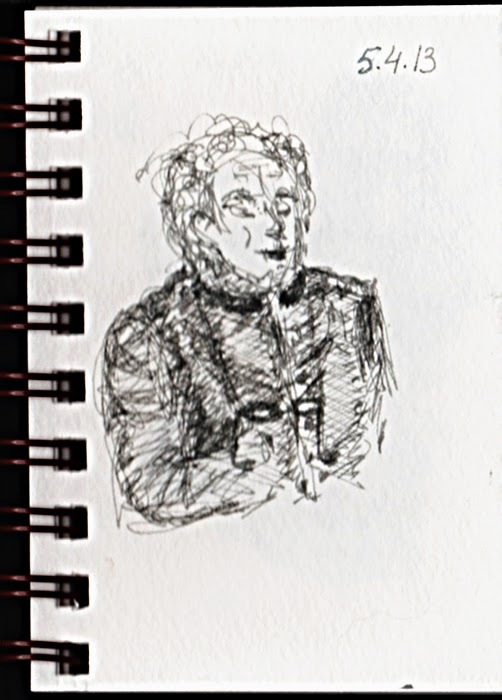 The "unintentional portrait" happens when a person is so engrossed in whatever they are doing that they will stay in position for a long period of time and present you with the perfect model from which you make your detailed sketch. The Stick Figure Silhouette: Stick figures thickened up to look like clothes. Perfect for subjects that are further away and the people are not the main focus. The A-Frame People: A variation of the stick figure based on the simple letterform “A”. It is the suggestion of a person without having to be anatomically correct. Perfect for subjects that are further away and the people are not the main focus. Block People - Basic: The human form made up of blocks and circles. No facial details needed and the pose contributes to the scene. Block People - Detailed: The human form made up of blocks and circles, but more detail is added such as clothes, hair, and the suggestion of faces. The Close-up Portrait Study: A more time-intensive study of the subject focusing on anatomy, shading, details, clothing and environment. Careful observation and attention to small details are important here. Shading can come in many forms such as watercolor, hatching, markers or pencil.